6 people, 1 locked room and a clock that is ticking down frantically. The goal - to identify the murderer, find the door and escape before it's too late. Exitus Escape Rooms at Macquarie invited us to try one of their 3 newly launched escape rooms. The room choices included Jailbreak, Moonshot or Forensic listed here in increasing order of difficulty. 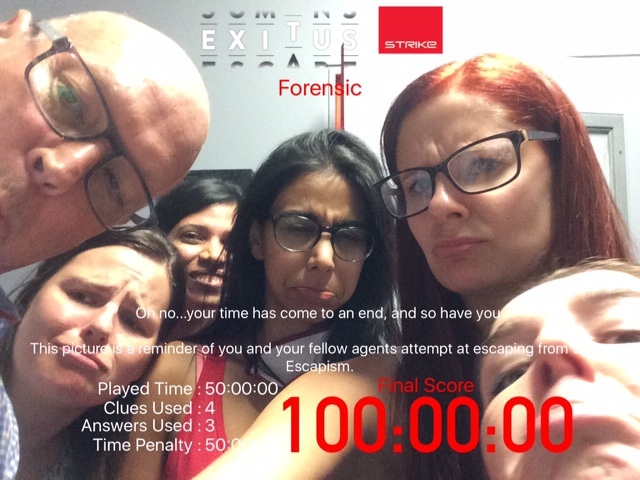 The brave ones that we were, we went for one with the highest difficulty level - Forensic. After a brief introduction to the features of the room and safety procedures by the friendly staff, it was time to brave the room. We were toying with our strategies which ranged from attacking the clues in teams of 2 or venturing out individually inside the room, however before we agreed on one, it was time to be blindfolded and taken into the room. Inside the room the first couple of minutes was chaos as we were assessing the room and figuring out where to start. Before entering the room I tried hard to find out 'what' we were meant to look for but the staff were too smart to give away any clues. Once you enter the room, it all comes down to quick thinking and an ability to identify a clue from what seems like an assuming portrait on the wall or a meaningless box in a corner. The smart ones in our group were quick to find a piece of evidence and a code to unlock a cupboard and very soon we were onto our second clue. At this point I thought we were making great progress. At each step of the way we also found QR codes that could be scanned to get help when solving a clue. I must admit we used a few QR codes when we realized the clock was ticking and we had to get out before we run out of time. One clue after the other stretched our imagination, utilised all corners of the brain cells and tested every iota of intelligence we claimed to have. Each time one idea failed, we were quick to move to an alternative one and carry on. The 50 minutes was packed with high energy, unfailing teamwork and plenty of moments of brilliance. Escape Rooms in Sydney are growing in popularity. With so many room options and pre and post game activities like karaoke, pool, bowling or just drinks, Strike has it all to make it a perfect corporate event activity, a fun birthday activity or perhaps just fun time out with friends. Book an escape puzzle room and Strike will treat you and your group with discounts at the bar and further activities. 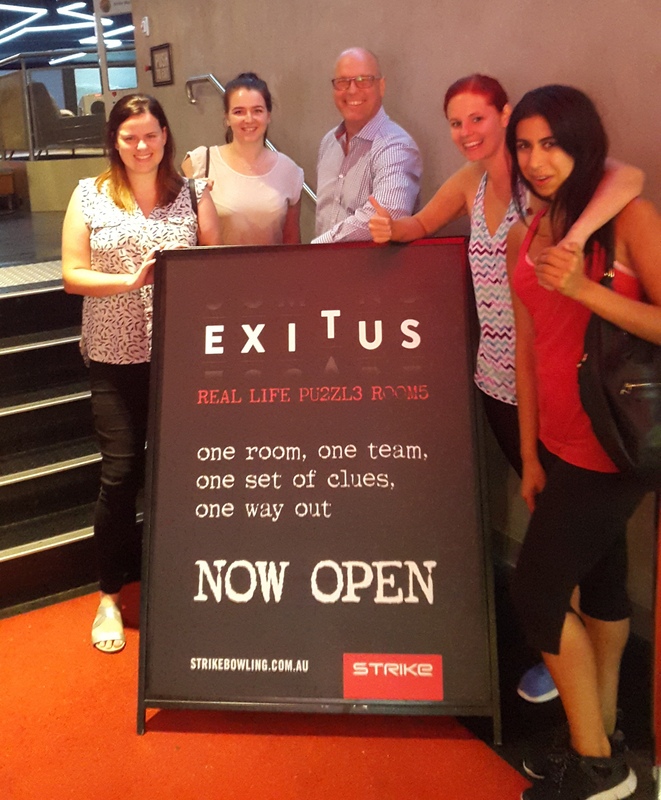 Strike operates Exitus escape rooms out of 2 Sydney locations currently, Macquarie and King Street Wharf. My room tip: Try the room with least difficulty level first if you've never attempted a puzzle room (just to get the hang of it). Ensure your group is a good mix of smart ones, creatives ones and radical thinkers. Most importantly, have fun!